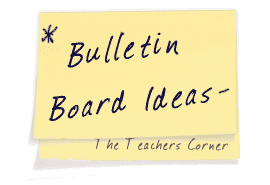 Our Patriotism Bulletin Board Ideas page will provide you with great resources for a number of patriotism related topics. Our bulletin boards will help you integrate various activities into your daily curriculum. Ideas within the patriotism bulletin board pages include resources that will help develop and foster a sense of patriotism in you students. After the terrible events of September 11th, we decided to create a special section for special bulletin boards. The bulletin boards in this section deal with Patriotism and can be used anytime during the school year. This bulletin board was inspired by the tragic events of September 11, 2001. This is a fun way for any age of students to show their support. Just having the children trace their hands in red, white and blue to help make a giant flag BB is a fun and easy way to show the American Spirit. At this time of year we are usually doing the "fall" themed Bulletin Boards. I took this idea and tied it to the current patriotic theme we are seeing so much of lately due to the tragic terrorist attacks. With the phrase: Patriotism is always in season (letters in alternating colors of r/w/b), I then traced off a tree with bare branches and used red, white, and blue leaves. I placed some on the tree and some falling from the tree. I went on the Internet and found the pictures of the three firefighters and the flag, a man who is holding a flag with a shadow of him behind it, and the NYPD officer with a flag hard hat and framed them in r/w/b paper and placed them on the board as well. It turned out really nice.